Like most of Canberra’s arts community, I was not anticipating the news that the Fringe Festival would not be funded into 2010, and that the National Folk Festival would be given greater funding to include a fringe event in their program. Jorian Gardner was apparently quite surprised about this, but I can’t say it wasn’t predictable. Jon Stanhope’s time as Minister for the Arts has seen the loss of many opportunities for emerging artists in the ACT, as well as an ever-increasing flow of ACT Government funding to interstate and international artists. And John Hargreaves, who has responsibility for a number of arts events under the spurious ministerial arrangements of the Labor government, has shown himself to have a very limited capacity for abstract thought. So given that the Minister for the Arts shows very little interest in emerging artists, and the Minister for Multicultural Affairs has no capacity to comprehend the kind of events staged at a Fringe Festival, I doubt there was ever any hope for continued funding of the festival. Nonetheless, Stanhope has apologised to Gardner for excluding him from the process, and The Canberra Cook is encouraging us to lobby for the continued funding of the Fringe. A protest is also planned for this Thursday (27 August) at 1pm in front of the Legislative Assembly. Personally, I’m completely over this notion of lobbying this government for anything. ACT Labor seem to think they’re exempt from democracy, and would probably like to disband the ACT people and elect another. Fringe events at the National Folk Festival are unlikely to include a range of art forms, and if the Fringe Festival is unable to find willing supporters to keep it going, it will be a sad loss for artists in the ACT. Fortunately, artists in the ACT are used to dealing with loss, and will no doubt carry on in spite of the ACT Government’s disdain for their work. For an interesting discussion of this news, see this post on RiotACT. There is a fine line between a documentary and a movie, but occasionally a film comes along that sits very comfortably on that line. Balibo is one of these. The very true story of Roger East, who Jose Ramos-Horta lured to East Timor in those few days between Portugal’s withdrawal and Indonesia’s invasion in 1975, Balibofollows East’s efforts to find out what happened to the five Australian reporters who had vanished amidst the Indonesian advance. 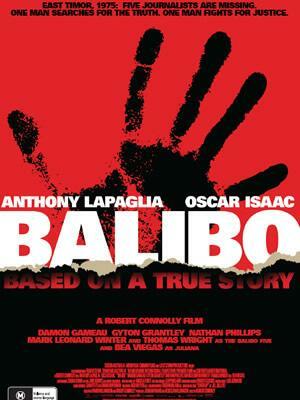 The film has a unique quality that at once depicts East’s story and allows the audience to engage fully with him as a character, while at the same time telling the story of the Balibo Five with a sense of documentary. The process is not unlike Brecht’s verfremdungseffekt, in the way that the film shifts from building dramatic intensity to communicating the facts of the story. This serves the purposes of the film makers very well. Talking about the making of the film (I went to Dendy’s Q&A session), director Robert Conolly talks about the Indonesian government asking whether the film will include the Indonesian point of view, to which he responded that the last thirty years of hearing the Indonesian point of view hasn’t gotten us any closer to the truth. I am not in a position to comment on the accuracy of this film as a historic record, but as a piece of cinema, it has more human honesty than your average documentary, and more depth than your average movie. East Timor celebrates ten years of independence later this month, so this is a timely release, in a way. It is, however, an Australian film about six Australians. What remains is to hear the stories of the East Timorese who suffered 24 long years of Indonesian rule. The makers of Balibo are aware of this, and provided training to East Timorese working with them on their film, in the hope that they will one day do so. Jane Austen’s novels don’t appeal to me greatly, but the quality of her wit is superb. 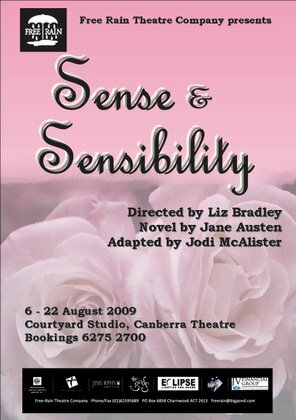 Although Sense and Sensibilityis not a novel that readily lends itself to a dramatic adaptation, Canberra’s own Jodi McAlister has done a fine job of condensing Austen’s story into two hours of engaging stagework. One of the most memorable characteristics of Austen’s work is the importance of the subtext, and the many paradoxes that are inherent in such a context. Drama, of course, thrives on paradox and subtext, but the sheer volume of these found in Austen’s work has been the downfall of many dramatisations of her stories. In this production, I think both Jodi McAlister and Liz Bradley are to be commended for their work in focusing the attention and keeping the journey of the characters paramount. A great performance by the cast was punctuated by three stellar performers in the roles of the three Dashwood sisters. Alex de Totth, Ylaria Rogers and Nicola Grear are most notable in the degree to which they are able to balance the humour of their roles with the truth of their characters’ experiences. This is critical to Austen’s stories, and the success of this production owes much to these three performers. I have never been a great fan of Austen, but have always enjoyed the quality and intensity of her satire, and am very pleased that this production managed to express it so well.